Waking up and leaving the warmth of my flat to go to work in the dark this morning was a very sobering experience. I'm tired beyond belief, but more mentally so. 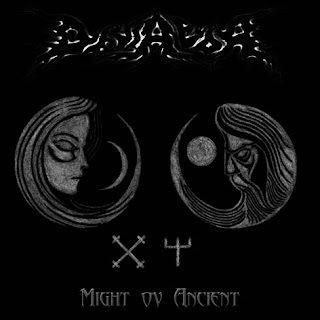 My mood is matched somewhat by the dark cover art that adorns "Might Ov Ancient", which is the latest full-length effort from Ukrainian black metal duo Deviator. It was originally released towards the end of last year both digitally and on tape (via Werewolf Promotion) before getting a cd release (via Kundalini Records) in August on this year. 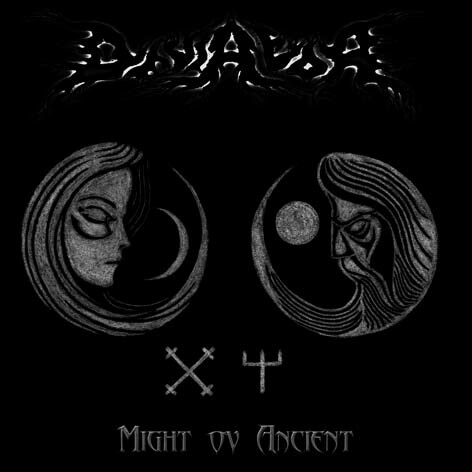 The album contains the three songs that appeared on the 2015 EP "Thy Immortal Majesty" and also a re-recording from the early 2008 demo "Estrangement". Might Ov Ancient sees Deviator pursuing a musical style that’s a lot more haunting than previous works. Album opener Cold Of Eternal Winter In The Heart contains semi-whispered (at least more restrained) black metal vocals and a slower tempo, while the guitar provides melody and synths provide majesty and a certain level of drama. Enchanted Circle is more familiar sounding, yet it still retains a brooding atmosphere. A lot more melodic and ambient for sure with no single element overpowering the others. The opening instrumental passage on Thy Immortal Majesty builds and then fades. Nothing remarkable about that you might think but it does highlight how effective the production/mastering is on this seemingly DIY release. The volume of the record is such that you really don’t have to turn it up too high to enjoy it, which is often a symptom of lo-fi/budget releases. Deviator seems to recognise this and has avoided that trap here. The main body of the song, consisting of more brutal black/thrash is not half bad either, interspersed as it is with more ambient textures. According to Metal Archives The Inner Self is a re-recording of the song that first appeared on the 2008 demo “Estrangement”, though I can’t see that song listed as being on the release. If someone could correct me here, it would be much appreciated. The song itself is an ambient piece with rousing strings and keys. Closing song Across The Gates Of Oblivion begins with the lowly sound of the wind before a bizarrely upbeat combination of keyboard/guitar that sounds as though it was lifted from an 80s pop song. It’s not long though before any notions of joy and happiness are withered away. That’s the thing about this release. It’s not truly depressive or caustic as it has plenty of melody and ambience and what the duo in Deviator has managed to do here is very admirable indeed.